Q: What is 'The Golden Army'? Q: Who's the guy in the weird diver's suit in the picture with Hellboy, Liz and Abe? Q: If Ron Perlman ever decides to stop playing Hellboy, who will replace him? As Good as the First Hellboy! I took this in at the L.A. Film Festival closing night gala and really had a great time. I'm a HUGE fan of the comics and thought that the first movie was done just right. 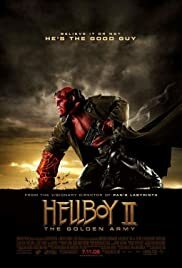 I think Hellboy II: the Golden Army is as good as the first movie. It takes awhile to get used to Doug Jones' voice as Abe, but once you do, you see why it's better to have the guy in the suit doing his own dialog. And Seth McFarlane does a fine job voicing Johann (although not as I had imagined him). The design work is superior to the first movie and the humor is ratcheted up a notch. The fights are better and more thrilling and the monsters are way cool. Great use of costumes and CGI working together (something Lucas should have done more of in the Star Wars prequels) to make everything feel REAL. I expect many won't like it as much as the first movie because the newness will be lost. This was in fact my immediate reaction as well; but after a few days I realized I was just as excited to see it again as I was the first one. The story isn't as grandiose as the first Hellboy, and the overall pace and build have a few problems. *POSSIBLE SPOILER* There is also a tad too much time spent with the many love stories (one of which works better than the others - Liz and Hellboy), but they all play out well. And an AWESOME flashback that had me grinning from ear to ear. PLEEEEEASE let there be at least one more Hellboy movie!!! 203 of 319 people found this review helpful. Was this review helpful to you?